Watch this Bigfoot sighting map! 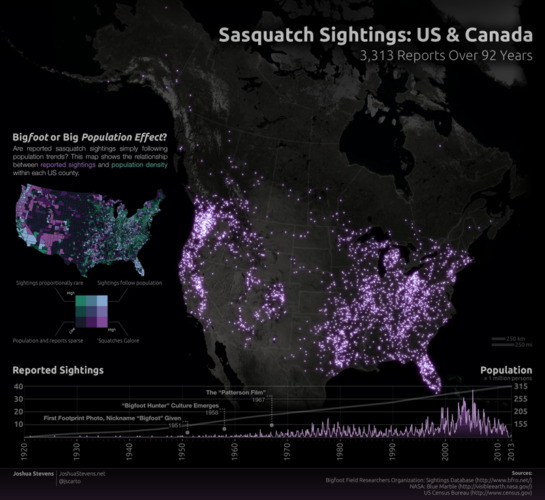 It compiles sasquatch reports in the US and Canada from 1921 to 2013! Amazing! Can you imagine that? 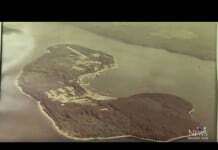 92 years of sasquatch reports or 3312 sightings placed on one map of North America! This amazing map of the mysterious sasquatch was made by Josh Stevens, a cartographer and geography graduate student at Pennsylvania State University. This impressive map was compiled from the sighting database of the American “Bigfoot Field Researchers Organization” (BFRO). You can see that sightings are not evenly distributed. At first glance, it looks a lot like a map of population distribution. After all, you would expect sightings to be the most frequent in areas where there are a lot of people. But a bivariate view of the data (right) shows a very different story. There are distinct regions where sightings are incredibly common, despite a very sparse population. On the other hand, in some of the most densely populated areas sasquatch sightings are exceedingly rare. Have you ever spotted the mysterious sasquatch? Is your entry on this bigfoot sighting map?